This simple ladder stitched bracelet is elegant and flashy - a bracelet that you will love to wear or give as a gift. And you need no beading experience to make it! Ladder stitch is one of the easiest beadwork stitches, but is typically used as a base stitch for other off loom beadweaving stitches such as brick stitch. This bracelet pattern is unique because it only uses ladder stitch. That makes if fast to stitch and very easy for new beaders. The key materials to this bracelet design are 4mm cube beads and crystal beads. The exact amount of materials you need will depend on the length of your bracelet. Always have slightly more beads than what is listed in the materials list in case you need to cull, or not use, some of the beads because they are irregular..
Cut a piece of beading thread at least 7 feet long. It can be difficult to add and end thread in this pattern, so using a longer thread than normal works well. Thread a needle on one end. Pick up two 4 mm cube beads and connect them using ladder stitch. Leave a tail at least 6-8 inches long for adding a clasp. Continue adding cube beads with ladder stitch until you have joined 5 beads. Reinforce the ladder by passing back and forth through each bead until you get back to the beginning of the ladder. 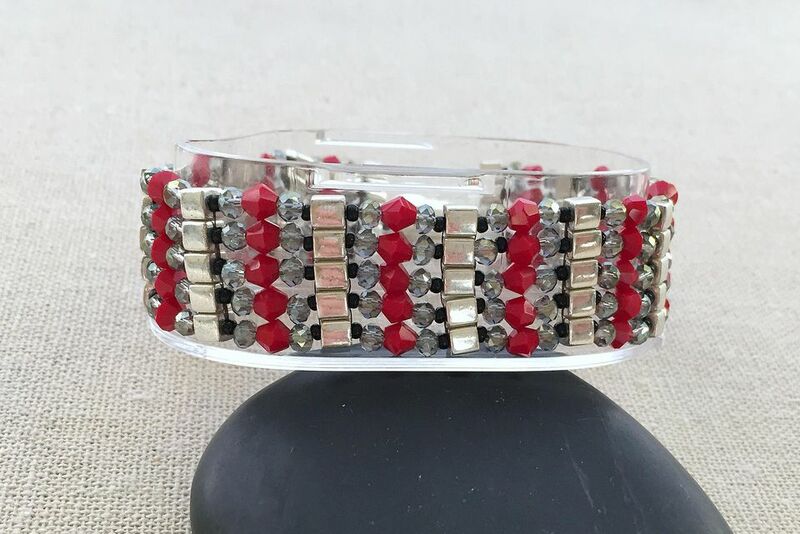 The design of this bracelet consists of ladder stitch sections connected by seed beads and crystals. Pick up one seed bead, a round crystal, a bicone crystal, another round crystal, a seed bead and a 4 mm cube. Push the set of beads down against the ladder of cube beads. Pick up one more cube bead. Use ladder stitch to connect this cube to the one at the end of the set of crystal beads. To do this, pass your needle up through the previous cube bead. Then put your needle back down through the cube bead you just added. Pull snugly so that the beads line up against each other. You are now in position to add more crystal beads. Pick up:one seed bead, a round crystal, a bicone crystal bead, another round crystal and seed bead. Stitch down through the second cube bead in the base ladder. Pass your needle up through the next cube bead in the base ladder. Pick up the next set of seed beads and crystal beads including a cube bead. Attach the cube bead to the prior set by stitching down through the cube bead and back up through the new cube bead you just added. Pull snugly so that the beads line up against each other. You are now in position to add another cube bead to the other side using ladder stitch and then stringing the crystal beads and linking it to the base cube beads. Add a total of five sets of beads for the component. You will end with the thread coming out of the top of the last cube bead you added. All of the cube beads should be joined together and aligned. The crystal beads join the two columns of cube beads. You will add the beads for the second and all subsequent sections in the same manner that you added the beads for the first section. As you add crystal beads, make sure that you only stitch around the cube beads from the prior row - do not go all the way down through all the beads in the first row. Continue adding beads and connecting the cube beads in this manner until your beadwork is the desired length. The exact method for adding the clasp will depend on what type of clasp you use. 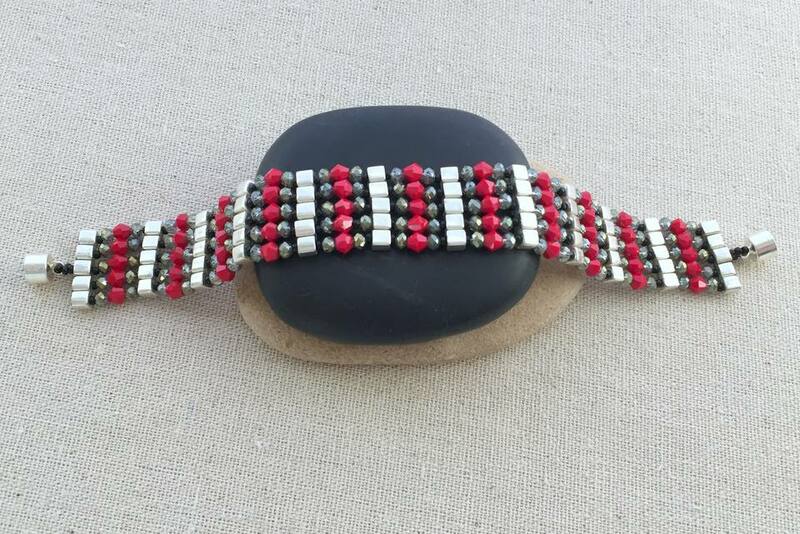 In the example, the magnetic clasp is attached using a small loop of beads on each side of the bracelet. Stitch through the cube beads to have your thread coming out the top of the center cube bead. Pick up 3 size 11 beads, the clasp and 3 more size 11 beads. Stitch back down through the cube bead. Stitch to the cube beads on the side and back to the center cube bead and stitch back through the size 11 beads and the clasp to reinforce. Do this as many times as necessary. Tie off the thread by weaving it in to the bracelet and tying a half hitch knot. Repeat these steps to attach the other half of the clasp using the tail thread. The cube and crystal bead bracelets are light and comfortable to wear, and will go with just about anything. You can vary the design by making a thinner version by starting with a ladder base of three cube beads or a thicker version by starting with a ladder of seven cube beads. You can also vary the colors of the beads or the shape of the crystals. As long as the crystals are 4 mm in size or smaller, different shapes will work with this design.